Well hello there everyone! How are you today? Can I tell you how happy I am that it's Saturday!? It has been quite a long week. I think it felt this way due to how it all started. I'm just ready to spend the weekend sleeping in, resting, painting, blogging, crafting more Pinterest crafts, and being thankful for everything I have. Today's manicure was yet another one that got lost in the drafts folder here on blogger. I really should start blogging every other day because I keep finding all these manicures I did and am having a tough time picking which I should post first. 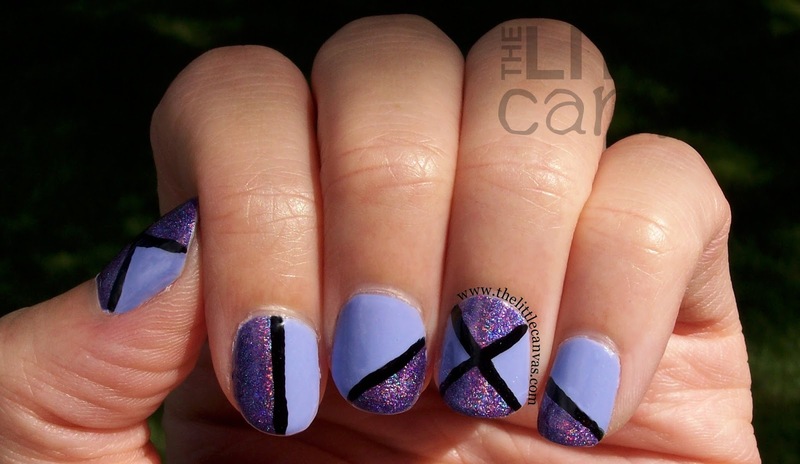 This one won tonight because it's purple and holo, and well who doesn't love that?! I got the idea for this manicure after being inspired by this pin which is of a manicure by Pshiiit polish. I fell in love with the cream grey polish accented with the the silver holo. I needed to have some form of this manicure on my nails right away! Since I didn't have a gorgeous silver holo like Pshiiit used, I opted for the beautiful purple holo that is Eternal Beauty by Color Club. I grabbed a bottle of lavender polish and got started! Really pretty, right?! I started off with a base coat of OPI Youre Such a Budapest which is a gorgeous lavender polish with a very subtle shimmer. It's application was decent. You could get away with two coats, but I used three to even out some random bald spots I had. It was worth it though because the color is just gorgeous. When the base was dried, I took my nail art brush and on black lines. I then filled in the areas I wanted to with Eternal Beauty using a nail art brush. When the holo was dried, I went back through with the nail art brush and cleaned up the black lines. I love how the holo looked against the cream base. The black line was kind of striking in between. I was originally going to use a dark purple cream polish but I hated how it looked on the one nail I tried it on. Only problem I had with the manicure was that I wish my lines were a little straighter and cleaner. I may need to try this again with an Orly Instant Artist striper and see if I can get a better result. This manicure was done before I received the Nail Art Society Kit which included those polishes. Which by the way, I will be holding a contest soon where the prize is a set of those polishes!!!! I need to work out the kinks with that still, expect it in the next few weeks!!! What do you think? Like the combo of cream and holo? Well, I'm off to enjoy my weekend. I hope you all have a great weekend!!!! Until next time, <3.